We all know that airports can be expensive places to eat and drink whilst you wait to board, but not with a Business Class ticket. For those who have splashed out the four-figure sum for their journey, each airline provides a nice quiet comfy lounge for its executive passengers where they can enjoy plenty of free food and drink, including alcohol, before heading to the departure gate. 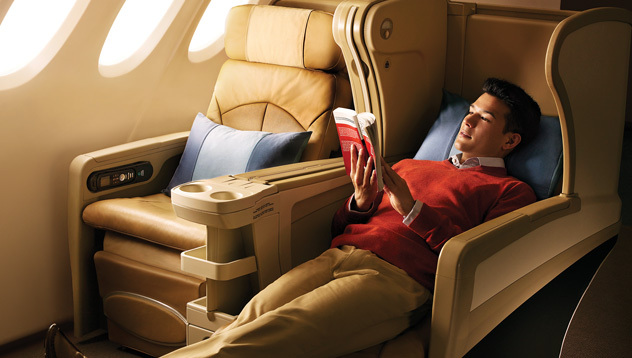 Boarding the plane has never been easier with a Business Class seat. You’re first on board, sometimes even before the elderly and those with children. On the bigger planes Business Class passengers often have their own entrance tunnel to ensure they don’t bump into those in economy fighting over the lack of overhead luggage space. One of the major perks of Business Class is the quality of seating booths. Modern planes are equipped with huge individually spaced reclining armchair seats, screens the bigger than your Nan’s TV, and a wireless NASA style touch-screen control panel. The seats are positioned far enough away from each other that you could do star jumps and still not touch the person next to you. There’s no more hunching over and licking your knee caps if you’re over six feet tall, and definitely no chance of the person in front putting their seat back and smacking you in the face with your own six-inch economy screen. Once on board you’re greeted like a famous person, and offered a glass of champagne to help you settle into your armchair seat. Once on a Business Class flight to the US one of the first things I was asked before I could even sit down was “how would you like your steak cooked sir?” You’ve got to love the Americans! Lobster starters, pastry selections, and an array of desserts often frequent a Business Class menu. My personal favourite was the after-meal cheese board with a cheeky glass of port. Now compare that to your economy class Diarylea triangle and beaker of cheap wine. Flying back from our wedding we managed to get upgraded to Business Class, thanks mainly we think to my wife lugging her wedding dress around in full view. Try it next time you get married, you never know! This flight was on one of the new double-decker A380 Airbuses. The entire top deck of these enormous planes are dedicated to Business and First Class passengers, with entry via roped off access akin to those seen at trendy bars and clubs. Unbelievably there is actually a bar to the rear that serves cocktails, canapés, plays music, and even has lap belts to strap yourself to the bar should it get a little bumpy whilst sipping your cosmo. First class passengers have their own cruise-style cabins, a bed, and also a massage service. That’s what a five-figure plane ticket gets you! Flying Business Class is certainly a special experience, and if money were no object, then I’d purchase a ticket every time. Unfortunately most of us cannot afford such luxury on our travels, and just hope that time we check-in that the free upgrade Gods are smiling down on us. Joining airlines frequent flyer programmes certainly helps your chances with this as they’re inclined to upgrade loyal customers when a flight is over booked and they need to move people from economy to Business Class.